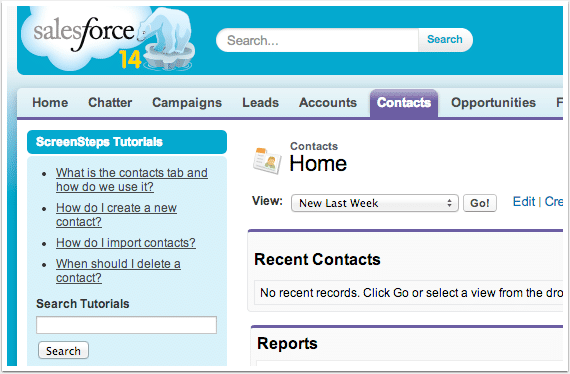 How Can You Use Contextual Help in Salesforce? The best kind of help documentation anticipates questions and problems that your users will have, and then makes the answers available right when your users have them. So making contextual help available to your users right in Salesforce can be a powerful tool when you're trying to improve how your organization uses Salesforce - but if it's not done right, it can leave you with the same hum drum results your PDF guides get as they continue to sit in the shared drive. Here are a few things to consider as you create contextual help articles. When I say contextual help, I am referring to the feature of having help articles/answers automatically appear based on the Salesforce object you are on and the user profile you have. 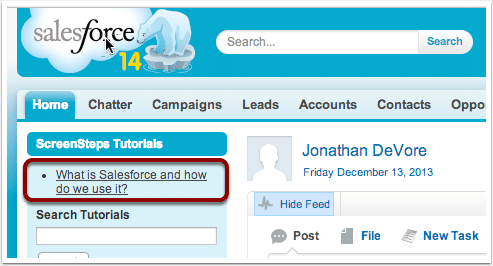 Tip: You can create Salesforce contextual help using the tagging feature in ScreenSteps. Your article titles automatically show up as links in the sidebar so your users don't have to perform a search. When users click on the link, they can view your article, like this one. Why are you making contextual help? The purpose of contextual help is to anticipate the kind of questions your users will have. Often times, users don't know what to ask, or how to ask it - if you can frame their question for them and then provide an answer, you will be a superstar. If they knew what to ask or how to ask it, then having "search" functionality would be sufficient. Another reason to have contextual help is to make users aware of new workflows and features in your Salesforce isntance. It can reinforce your email announcements and live training, getting people to learn the new process. First answer "What do I do?" When your users are new to Salesforce, their questions are going to be along the lines of, "What do I do?" Articles that explain "how" to do a task aren't that helpful because users won't be able to put the "how" into context. So create help articles that go over the main workflows at a high level. This would be a good place to have a video that explains concepts and covers a high-level overview. For example, you could title an article "What is Salesforce and how does [Org name] use it?" and make it available in the "Home" tab. When your users go into the various tabs, have articles with titles like, "What is this tab used for?" or "What am I supposed to do in this tab?" Because those are the questions that your users will have when they first begin using Salesforce. Your Salesforce instance is always changing, so write articles for new custom objects. When somebody clicks on the new object, your contextual help article that explains what the object is used for, will automatically appear. Then answer "How do I do it?" Below the articles titled "What is this tab used for?" have articles that answer the next set of questions your users will have - "How do I ...?" After they know what they're supposed to do, the next question they'll have is, "how do I do that?" Your help articles can take them through the process, one task at a time. Your contextual help doesn't have to be static. After a while, the articles that answer "What is Salesforce?" may not be necessary - so replace them with other frequently asked questions. You don't have to delete articles that you're replacing, just don't have them show up in the sidebar anymore. If your contextual help is stagnant, your users will start to ignore it and this feature won't be as powerful. If you recently made a change to a workflow, feature an article that explains what it is, followed by articles that explain the "how." After a few weeks, you can probably remove the article that explains "what" and replace it with aritlces that explain answers to other questions that keep popping up. This is a great way to reinforce your email communications and announcements in meetings - right after you talk about it, the instructions for implementing the new workflow show up to help everybody walk through the new steps. Different user profiles will have different kinds of questions - so answer their unique questions in separate articles, and have them appear based on their user profiles. Here's how to do that with ScreenSteps. If the contextual help articles aren't specific, then they're not going to be helpful. Only highlight 3-5 articles. You don't need to include every article ever written about that object - just provide enough articles to get your users started. Within the articles themselves, you can have links and references to more in-depth information and workflow instructions. Too many articles on the sidebar look cluttered and will be hard for your users to sort through. Users can always type their question in the search field, or browse your custom documentation tab to find a relevant article. How else are you using contextual help to improve user adoption? If you're interested in trying out ScreenSteps to add contextual help articles to your instance of Salesforce, sign up for a free trial.